We are excited to announce our speaker for Moms & Tots week June 22 -26th. Bonni Greiner is married to Nevin, and they have eight children ranging from their early teens to late twenties. 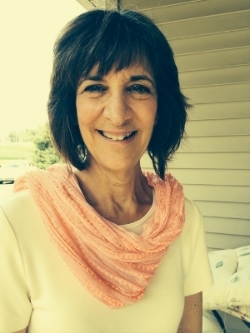 Bonni was raised in a Jewish home and came to know Jesus as an adult, shortly before she was married. She quickly became a popular speaker for church groups, women’s retreats, and Mothers of Preschoolers groups. She fills her days praying, speaking, homeschooling, blogging, and trying to be the Titus 2 older woman that she had difficulty finding when raising her own brood. Be sure to check out her insightful blog at www.mombyexample.com or her book, Recapturing the Joy of Motherhood. Moms & Tots is a week of fellowship and special activities just for moms with young children ages newborn to 6. Daily child care and kids' activities are provided during moms' worship/teaching time. Look forward to specially planned activities for you and your kiddos! Newer PostGroundbreaking Ceremony a Success! Older PostWhy Work on Summer Staff at Camp Hebron?